Grilled chicken Himachal style is a delicious dish. You can eat with veg fried rice. It is prepared using aromatics like ginger and garlic. Vegetables should be crunch and crisp. Love grilled chicken? Who does not except for non vegetarians? But have you ever tried making it how it is prepared in Himachal. We bet, you would love it even more than the usual one who you have been cooking your whole life. 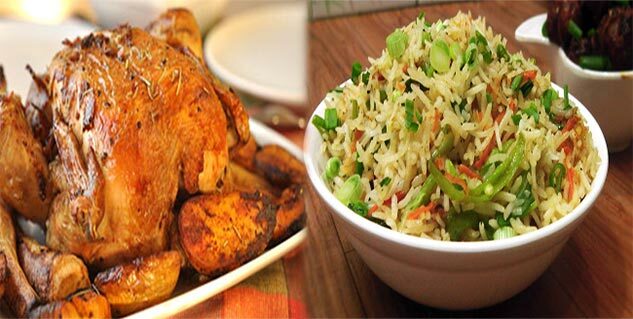 So, get set and be ready to learn how to prepare grilled chicken Himachal style with fried rice. Take chopped onions and 1 green chilli in a bowl along with malt vinegar and keep it aside. Now slit the chicken legs and dry roast the spices in a pan. Put the spices in a mortar and pestle and grind into a nice powder. Now it’s time that you dry roast the aromatics; ginger, garlic and green chillies. Add some mint leaves, jiggery, and juice of 1/2 a lime to this spice paste. Pour a few teaspoons of ghee onto the chicken and rub in the marinade. Put into the fridge for 2 hours or so. Then bring the chicken to room temperature and season it well. Heat a tava with some oil and sear the chicken on a high flame till nicely coloured, turn down the heat and fry gently, deglazing with a little water to prevent the masala from burning, unti it’s a nice golden brown in colour. Baste with ghee/ butter and lime juice and cook till the chicken is tender and cooked perfectly. Now scatter over some fresh coriander. Rinse rice well before soaking them in water for 30 minutes. Now drain and keep them aside. Now put the rice in a pot and bring it to a gentle boil 4.5 to 5 cups of water with salt and 2 to 3 drops of oil. Add the soaked and drained rice to the hot water. Now on a low to medium flame cook the rice without the lid. Once the rice are cooked, remove the pot from fire and drain the rice. you can also gently rinse the rice in water so that they stop cooking and don't stick to each other. cover the rice and keep aside till the rice cools completely. When the rice is cooling, chop the veggies finely and keep aside. Heat oil in a pan. First add the star anise and fry for some seconds or till the oil becomes fragrant. Add the garlic and saute for some seconds. Add the spring onions whites/scallions and saute for about 2 minutes. Now add all the finely chopped veggies including the celery. Increase the flame to a medium or high and stir fry the veggies. Keep tossing them and stir while frying so that the veggies are uniformly cooked and do not get burnt. The veggies have to be stir fried, till they are almost cooked and yet retain their crunchiness and crispiness. Add the soy sauce, salt and pepper. Stir quickly and add the rice. stir fry for a few minutes till the sauce has coated the fried rice well. Keep a check when adding salt, as soy sauce already has salt in it. 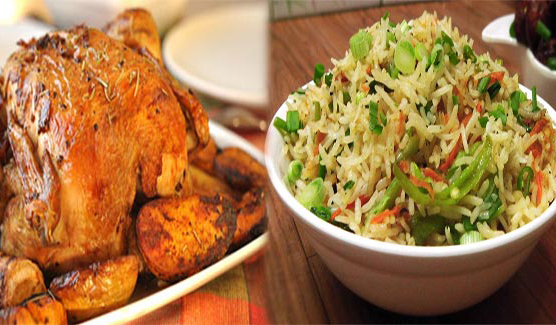 Serve the veg fried rice hot plain with your Grilled chicken Himachal style.